Egg whites are a nutritious, economical food, containing 4 grams of high-quality protein in each serving, along with a number of important vitamins and minerals. Because of these benefits, some people add raw egg whites to protein shakes or health smoothies, while discarding the egg yolk to avoid unnecessary cholesterol. However, both whole eggs and egg whites can present serious health risks when eaten raw. Drinking egg whites raw can cause food poisoning, with vomiting, cramps, diarrhea and in severe cases, death. Eggs can become infected with a type of bacteria known as salmonella. When eggs are cooked, salmonella and other bacteria are killed, neutralizing any potential health threats. Salmonellosis is a bacterial illness that lasts for four to seven days and can present symptoms including vomiting, fever, diarrhea and abdominal cramps, according to the Centers for Disease Control and Prevention. While salmonellosis can be severe and may require hospitalization, most people recover without antibiotic treatments. In addition to cooking egg whites before eating them, it is important to avoid cross-contamination with kitchen utensils that make contact with raw eggs. According to a study published in 2016 by the International Journal of Environmental Research and Public Health, there are approximately 1 million cases of salmonella-caused foodborne illnesses in the United States every year, and eggs are the primary source of these infections. Eggs can become contaminated with this bacteria while they are still forming inside the hen, or contamination can occur after the egg has been laid. How eggs are stored, handled and how food containing eggs is prepared can all increase the risk of salmonella contamination. 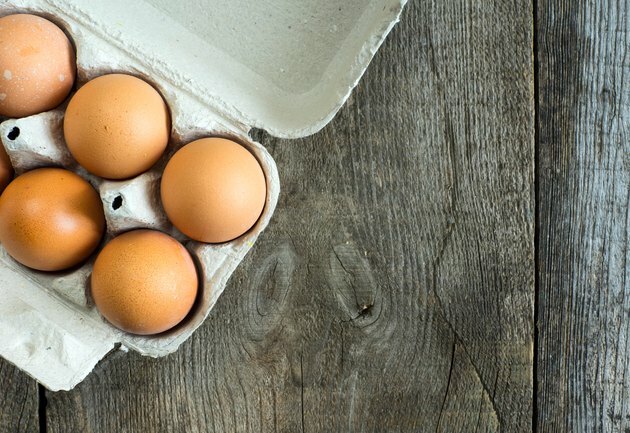 It has been suggested that free-range environments may reduce the risk of salmonella contamination, but it is safest to assume that all eggs are potentially contaminated, handling them carefully and cooking them before consuming them. If you can't live without raw egg whites, there is a way you can consume uncooked eggs without the risk of being exposed to salmonella. Pasteurization is a process during which food is heated to a temperature that kills potentially dangerous bacteria. You can purchase store-bought pasteurized eggs that have been heated just enough to kill any bacteria, without cooking the eggs. As an alternative, purchase liquid egg whites, which are always pasteurized. The majority of whole eggs sold in grocery stores are not pasteurized, so you must verify that they have been pasteurized before drinking raw eggs. Another risk unique to egg whites has nothing to do with pathogens. According to MedlinePlus, raw egg whites carry a substance that binds strongly with biotin and prevents it from being used by the body. Deficiency in biotin, also known as vitamin B7, can cause a number of symptoms, including thinning of the hair, skin rashes, depression, tingling sensations and exhaustion. MedlinePlus also notes that eating two or more egg whites per day for a period of several months or longer can cause severe biotin deficiency. If you are drinking raw egg whites, it may be safest for you to limit your consumption.